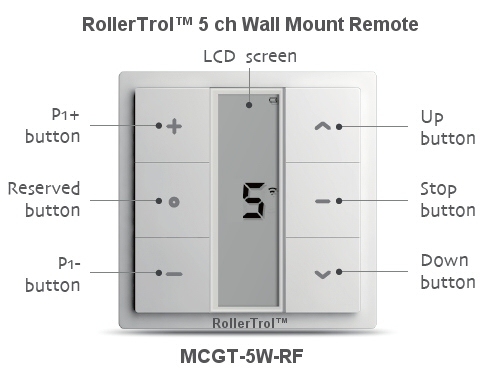 Our radio control motors are designed for use with our multi-channel hand held remotes, wall mount switches, timers and sun sensors. This article is about using our surface mount wall switches, but the procedure is much the same for all our controls. 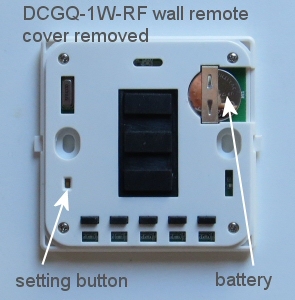 The one channel wall remote has a setting switch (P2) on the back, by the battery compartment. The switches are approximately 3.5 inch (90 mm) square. The P2 button is used to assign channels to motors, and to perform other programming functions, as detailed in the sections further down this page. 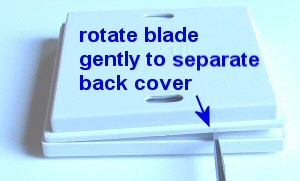 Other models use a combination keypress as a substitute for the P2 button, as detailed below. The two channel wall switch uses a keypress combination on the front panel as the setting switch. Please press the UP and STOP buttons on the appropriate channel whenever you see the instruction below to press the P2 button. The 5 and 15 channel wall switches also use a keypress combination on the front panel as the setting switch. Please press the P1+ and RESERVED buttons for the appropriate channel whenever you see the instruction below to press the P2 button. 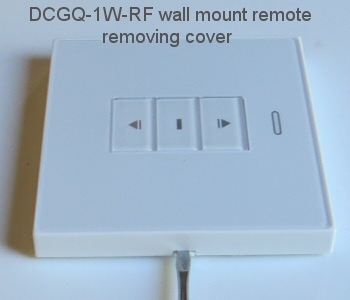 Please Note: If your wall mount remote looks different from the unit in these pictures, please see section 3 with details about the GQ series. They work the same way, but there are slight differences in cosmetics and button positions. You should be able to see the P2 programming button beside the battery compartment (see picture). 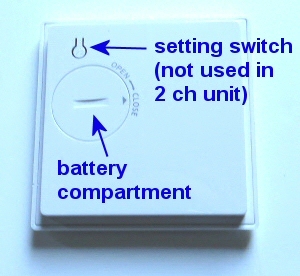 The single channel wall switch uses this button for programming the motor functions, but the 2, 5 and 15 channel units do not use this (even though the plastic button appears to be there). 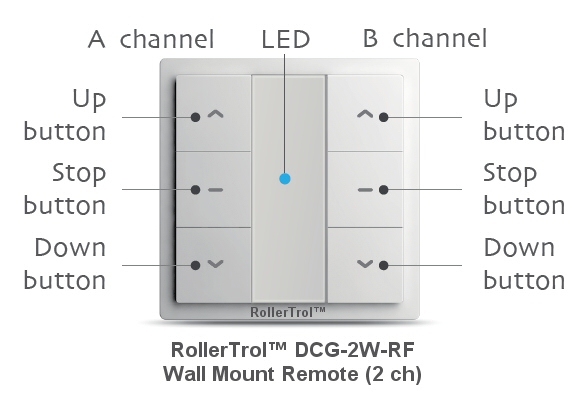 Please Note: The 2, 5 and 15 channel wall switches (G series only) use a combination of 2 buttons (UP and STOP) to execute programming instructions (as above). Wherever you see an instruction to press the P2 programming button in this article, if you are using the 2, 5 or 15 channel remotes, you need to press the apppropriate buttons as explained above. If you have set up your motor on some other remote control 'master', you can very simply clone the motor assignment to the wall switch. You would generally only need to do the full programming instructions (starting at Part 3) if you only had a single wall switch and no other remote, or if you wanted the wall switch to be the 'master' for some reason. If this is a 2 channel wall switch, you will use the appropriate buttons for the channel you want to assign the motor to. 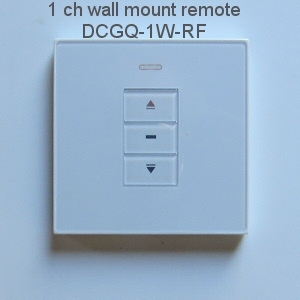 Press the P2 button on the wall switch if it is a 1 channel remote (see picture above) or UP + STOP simultaneously (on the appropriate channel), if it is a 2 channel remote, and P1+ and RESERVED buttons if it is a 5 or 15 ch remote. The motor will beep 7 times and jog. At this point, you are finished - the wall switch will control the motor, and the travel limits will not be changed. You can push the manual buttons on the wall switch to test it. 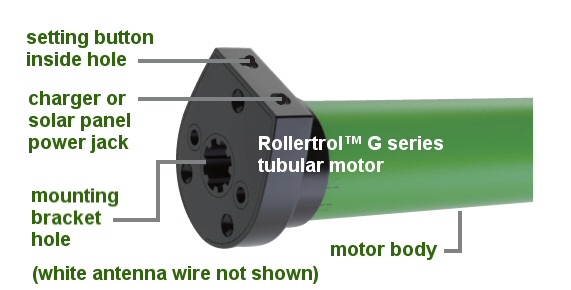 Each RollerTrol™ motor has a small hole for the setting button on the outside edge of the exposed cap at the antenna end of the tubular motor. There may also be a solar charger jack if it is a battery motor, and it will also have a short white antenna wire if it is a remote control radio motor. Inside the hole is a small button switch for activating the 'programming' mode of the motor. 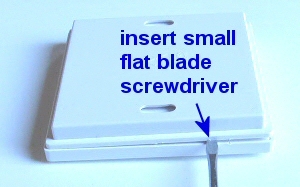 You will need a small blade screwdriver or similar object to insert into the hole to reach the setting switch. Note: All of the following procedures require 6 seconds of pause after completion. Please wait before you try a new procedure. If this is a multi-channel remote, press the channel buttons until you see channel 1 (or desired channel assignment) displayed on the REMOTE. 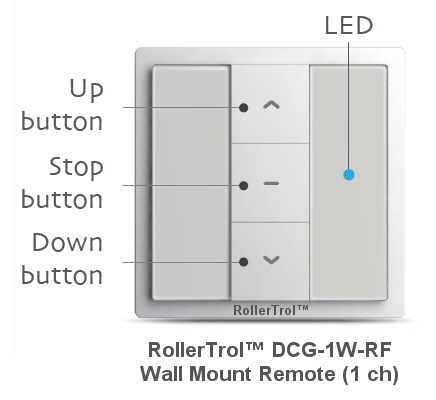 The travel limits of a RollerTrol™ motor can be set and changed at any time with the remote control; you do not have to touch the motor at all. You can assign a motor to more than one remote control; the motors can 'learn' the bit pattern of more than one remote. Note that no two remotes use the same encoding, so you must go through the learning procedure with any additional remote you wish to use.